IN IRAQ, ISIS zealots smash centuries-old artifacts and blow up churches. In Yemen, Shia militias plough through cities as Sunni neighbour Saudi Arabia rains down missiles. 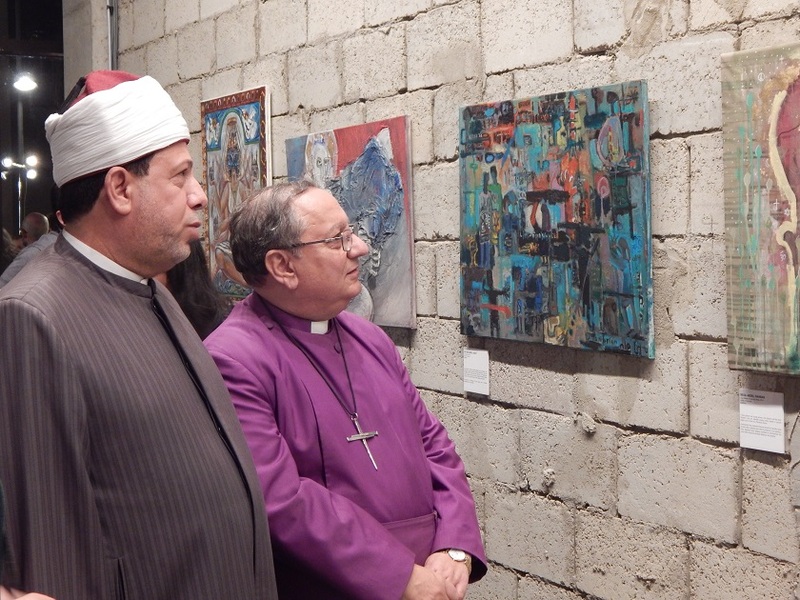 Egypt is not without its own religious tension, but a timely interfaith art exhibition in Cairo intersects with perhaps the only potentially good news coming out of the region. Iran may be rejoining the international community, and Iranian-born Azadeh Ghotbi is coming to London. Born a Muslim, educated in a Catholic school and married to an atheist beside a Jewish bridesmaid, Ghotbi has lived in five countries across three continents. Her parents fled the Islamic Revolution when she was a child. Today,Ghotbi is one of 47 premier and emerging artists featured at the CARAVAN visual arts exhibition. Founded in Cairo in 2009, its yearly offerings travel the world, dedicated to the message of interreligious peace and cultural understanding between East and West. Her piece is entitled Crossroads, and her message fits perfectly with the theme of the exhibition, The Bridge. Ghotbi’s art has been exhibited in top galleries in Europe, the United Statesand Iran. The last of these has informed several pieces. In the Name of Freedom interlocks the E’s to symbolize encaged rights and restrained voices. The Trappings of Theocracy is constructed with unpainted, faceless miniature figurines. They are not Iran-centric, Ghotbi said, as oppression is not limited to one country. But in Give Peace a Chance to Soar, she directly critiques her country of origin. Faced straight on, the black letters of peace are hard to read behind the iron bars of a cage. But the inset of the letters is radiant turquoise, a colour she associates with the beauty of Iran, and only visible if you changeyour viewpoint. Ghotbi crafted Peace in 2013, eager for change. Two years later, Ghotbi is enthusiastic about the framework agreement signed by Iran and Western nations. As Tehran reduces its nuclear capabilities and allows comprehensive inspections, international sanctions will be gradually eliminated. Sanctions have disproportionately hurt the poor and middle class, she said, while strengthening the political hand of the hardliners. The US Congressional Research Service reported a five percent contraction of the Iranian economy in 2013 along with a 56 percent currency devaluation and a 45 percent rise in the rate of inflation. CARAVAN founder Paul-Gordon Chandler echoes Ghotbi’s optimism. ‘I am very pleased about the deal going ahead,’ he told Lapido Media. ‘We have to work toward peoples coming together. An American, Chandler grew up as a minority Christian in mostly Muslim Senegal. He was deeply influenced by the local arts scene, but also disturbed by the tensions between the two faiths. It was not until his ten years as an Episcopal priest in Cairo’s historic St. John’s Church that a vision began to form. Initially, CARAVAN was held only in Egypt, but over the past two years more than 300,000 have viewed the traveling exhibition in London, New York, and Washington, DC. This year, The Bridge opened at the oldest church in Paris, the Eglise Saint Germain-Des-Pres, during the United Nations week for interfaith harmony. Following its current station in Cairo it will move to St Martin-in-the-Fields, Trafalgar Square from June 1 – July 31. But CARAVAN is not intended only for the Western elite, as important as it is for them to see this example of cooperation between Arabs, Persians, Muslims, Christians, and Jews. The exhibition will travel also to rural areas in the United States, where misunderstanding of the Middle East is prevalent. And in the Middle East, where spin-off projects are in development in Jordan, Tunisia, and Malta, the indirect approach of art can make all the difference. According to Bishop Mouneer Hanna Anis, archbishop of the Anglican diocese of Egypt, structured efforts at dialogue between religious professionals have not impacted reality. The Middle East needs CARAVAN, Ghotbi believes, but art is not enough. Education, jobs, and women’s rights are necessary to ease religious clashes between groups that used to coexist peacefully. Chandler agrees, noting that transformation through art is a long term process. However much the Middle East needs this message, it can also export the example. 47 artists are living testimony.